Please note: the Sky Ride is currently out of action following a fire which destroyed one of the stations. The ride is expected to remain closed until the 2010 season at the earliest. There has been a sky ride transport system in the park as long as we can remember. The original one followed the same route as the current sky ride, but only went from the bottom of Towers Street to what was to become Forbidden Valley. 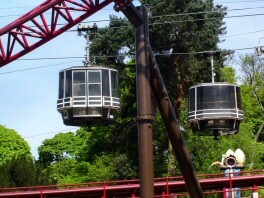 The original cable cars could carry a maximum of four people at a time, and as the park was increasing in popularity, and the fact that it would soon be opening a new area of the park near the Chinese Temple, a new modern sky ride was purchased and constructed. The new gondolas were designed and manufactured by Poma, and civil engineering was done by Sir Robert McAlpine who also constructed the Grand Canyon Rapids a few years previously. The new system uses several gondolas, each of which can carry up to ten people at once. This is definitely not one for vertigo sufferers, as the gondolas travel very high above the gardens. The gondolas travel at a sedate 4 metres per second, allowing spectacular views as you travel over the garden valley from Forbidden Valley to Cloud Cuckoo Land. Please note that you will be asked to vacate your gondola at the "end" stations (Towers Street and Cloud Cuckoo Land).